IP20 360° detection angle 6m range. Adjustable time delay 10sec to 15min. Switching capacities 110V-130V max 500W, 220-240V max 1200W. 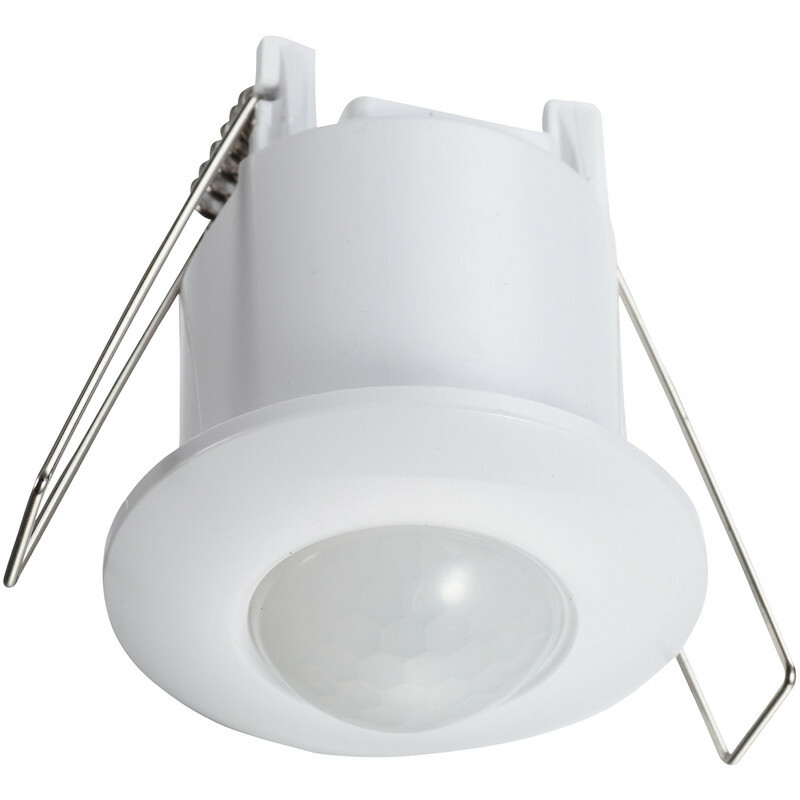 360° Ceiling PIR Single Sensor Flush is rated 4.1 out of 5 by 30. Rated 3 out of 5 by Penn from Mind of its own Bought and fitted by electrician. Seems to work on its own - on /off on/off. We have changed the lux level and is set on the lowest time setting. Is in the hallway. Is this made in China? Rated 5 out of 5 by Foxy1957 from Ceiling mounted sensor Replaced an old sensor with this unit is toilet. Easy to install and works perfectly. Rated 1 out of 5 by Blurg from Stops working After only a month or so of service just keeps turning on! Sited in a closed cupboard with nothing to set it off. Poor! Rated 5 out of 5 by Richard Brown from Very Neat & Decrete Little PIR Sensor Bought this to automatically switch a light on in an "open-fronted porch". Unfortunately it keep switching on & off randomly, so I "bench tested" it in a room & it worked perfectly, as it should, so it wasn't faulty. I put it down to shrubbery moving in high winds that day ( around 5m away ). As there is no sensitivity control, it clearly wasn't suitable for my location. I've replaced it with a sensor with a senitivity control from another suppler & will save this for another project. Rated 3 out of 5 by gazzag from works as it should Took a bit of trial and error to get the wiring right as I'm not an electrician. Also its hit and mis whether the stew hold the wire in place, sometimes it did, sometimes it didn't even when the wire was right in. Once I got around those problems it was good and I will buy another for my garage. Rated 4 out of 5 by Mal66 from 360 pir Fitted this on Friday and it was very simple. Works great. Straight off the light and easy to set up . A lot smaller than I was expecting which was nice.